The ASEES Congress is in its second day. The program, despite being formalized in a rather fat booklet, has more to offer than just panels and round tables. In fact, there are other scholarly events happening in Lviv—some undoubtedly galvanized by the presence “here and now” of humanities specialists from a number of countries, who do not often have the chance to get together. Connected to the Congress and yet completely independent from it was a ceremony, hosted by the Canadian Institute of Ukrainian Studies, to award the best Ukrainian studies publications in the field of humanities and social sciences. This prize was inaugurated in 2013 and has already been awarded once. It is given in two categories—for best book and best article. The main criteria include high research quality, application of modern methodologies, and innovation for Ukrainian studies and for scholarship as a whole. Nominated texts can be written in any country of the world, and in any language, including research by Ukrainian scholars abroad or outside Ukrainian ethnographic territory. In the future, there are plans to provide separate awards for publications in Ukraine and those published abroad. The award committee is organized as two groups—a selection committee in Ukraine that includes leading scholars from various fields, and the judges in Canada, who adopt the final decision on the awards. The chair of the selection committee in Ukraine is Natalia Yakovenko; in 2014–15, other members of the committee included Yaroslav Hrytsak, Vitali Mykhailovsky, Volodymyr Panchenko, Oleh Turii, and Olha Filippova. The committee members change every year, with members in future anticipated to also come from the USA and Canada. Starchenko, N. Chest’, krov i rytoryka: konflikt u shliakhets’komu seredovyshchi Volyni (pizne XVI – rannie XVII st.). Kyiv: Laurus, 2014. Hrytsenko, O. Pam’iat’ mistsevoho vyrobnytstva: transformatsiia symvolichnoho prostoru ta istorychnoї pam’iati. Kyiv: KIS, 2014. Slipyj, J. Spomyny, eds. Ivan Datsko and Maria Horiacha. Lviv: Vydavnytstvo UKU, 2014. Gil, A., and I. Skoczylas. Kościoły Wschodnie w państwie polsko-litewskim w procesie przemian i adaptacji: metropolia kijowska w latach 1458–1795. Lublin-Lviv: Instytut Europy Środkowo-Wschodniej, 2014. Osyn, V. Akademiia i politicheskii rezhim: Akademiia i neopatrimonial’naia nauka v Ukraine (i Moldove). Ab Imperio 3(2014). 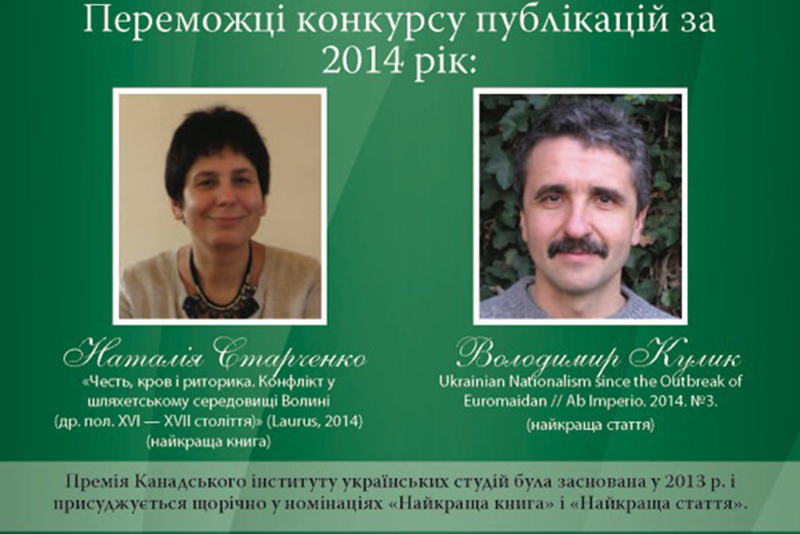 Kulyk, V. Ukrainian nationalism since the outbreak of Euromaidan. Ab Imperio 3 (2014). Certainly, anyone can draw their own conclusions from the short list (it would also be desirable to see the long list). My own immediate observation was that both articles were published in the same journal—Ab Imperio. This publication is indeed authoritative, whose contents are peer-reviewed (which is often virtually absent from Ukrainian humanities), and its editorial board works closely with authors. On the other hand, the journal is already well-known and represented in the Internet, and one can’t help but reflect that other, equally authoritative publications may have been overlooked… Be that as it may, let us turn our attention to the event at hand, which took place at the Lviv National University. The moderator of the ceremony, Natalia Yakovenko, presented it as a pageant consisting of a prologue and two acts. In the prologue, the technical assistant of the awards committee, Iryna Sklokina, described the basic idea of the award. It should be noted at this point, that in addition to a diploma and prize money, the winners receive an inukshuk—a sculpture of the Inuit First Nation of Canada. The inukshuk was historically used by the Inuit, among other things, to mark trails or food caches, indicate directions, and warn of dangers. 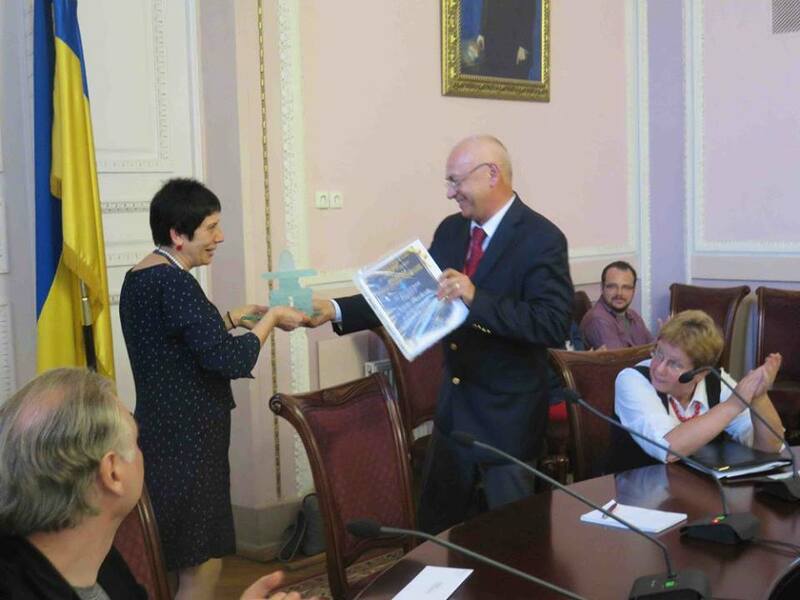 Sklokina reminded everyone present that the inukshuk should serve as a reminder of CIUS as the northernmost Ukrainian studies institute in the world, first of all, as well as a guidepost for researchers and a symbol of intercommunication at a multitude of levels. Following the format of the ceremony, during the first act we learned about the laureates and their scholarly achievements. Current issues related to the topics covered by the authors were also highlighted, as well as the state of Ukrainian humanities in general. In the category “Best Book,” the winner was a book by Natalia Starchenko titled (in translation) Honour, Blood, and Rhetoric: Conflict in the Milieu of the Volhynian Nobility, an overview of which we have already posted on website. According to the Laurus editor-in-chief Mykola Klymchuk, this was the last book published by Laurus before the Revolution of Dignity (Euromaidan). It has gone through two editions and found a broad readership. Klymchuk believes that the secret of this book’s success is due in part to the quality of printing and the many illustrations; on the other hand, it was the result of lengthy labours. Klymchuk remarked, “For 10 years I heard that Natalia Starchenko was writing a book… it became a kind of a meme already. Now the book is done, but in order to complete the gestalt, it needs to be adapted into a blockbuster screenplay!” The content of the book was described in more detail by Oleksii Vynnychenko and Yuri Voloshyn. They asserted that Starchenko’s research heralds the repudiation of Soviet practices and a new era in Ukrainian historiography. Her book gifts the reader with a close-up introduction to early modern [society], and is moreover written in a light style, saturated with vivid metaphors; it’s an exceptionally wonderful read. 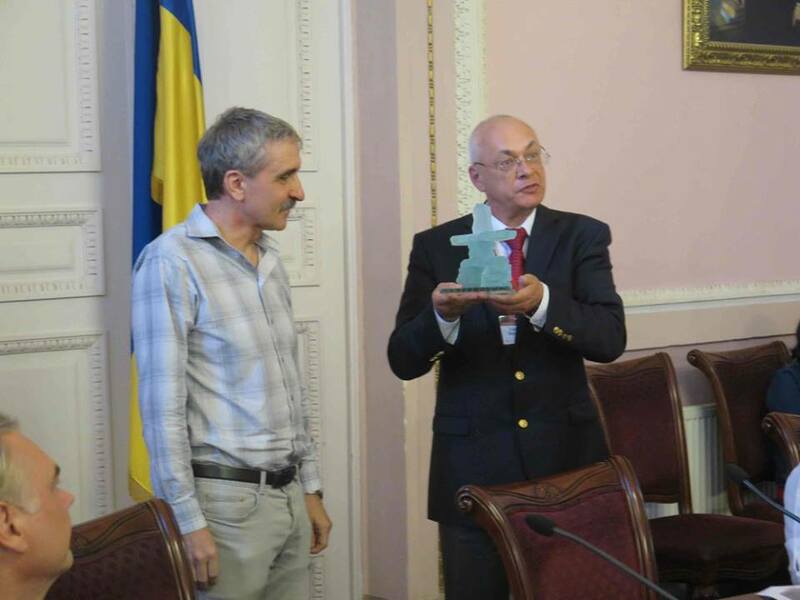 In the category “Best Article,” the inukshuk went to an article by Volodymyr Kulyk (in English) titled “Ukrainian nationalism since the outbreak of Euromaidan.” His comrade-in-arms Oleksii Haran noted that Kulyk is one of few Ukrainian “politologists” whose work reflects the current level of contemporary political science. This article is written fresh from the heat of the battle, and analyzes nationalism at two levels—the elites and the masses. It reveals to the world, from the strictly academic poli-sci point of view, what was going on at the Euromaidan in Ukraine. Back to the pageant—the main players in the second act were the laureates themselves, who read from their works and described their paths to success. Starchenko credited being surrounded by successful colleagues who never begrudge anyone their assistance, ideas, sources, or books. Kulyk shared his experience of writing a difficult piece about the Revolution of Dignity as a participant: “At the Maidan, I switched off the researcher and became a physical body; then I switched on the scholar and wrote the piece for Ab Imperio—but to do so, I did have to crawl out of the ivory tower.” Kulyk believes that the importance of such awards is that they add structure to the field of scholarship. For my own part, I would emphasize the benefit of having ceremonies to confer such awards. Besides the pageant itself, this gathering was conducted as a high-level roundtable, particularly thanks to its powerhouse of participants and excellent discussions. And she talks so highly of you as well, Marian! I have seen her give a lot. It happens to be, she has a heart of gold. So very glad you stopped by to add a great piece to the sty.orThe other Red.